Historians have described Albania prior to the end of the Cold War as the most closed off, most hostile to religion of any of the European Communist countries. Dictator Enver Hoxha succeeded in getting article 37 put in the Albanian constitution. It read in part, “The State recognizes no religion, and supports atheistic propaganda in order to implant a scientific materialistic world outlook in the people.” The government under Hoxha wasn’t simply neutral or secular. It was hostile toward religion. That reality changed drastically in the 1990’s. Communism began to crumble around the globe, and in 1992 professors from The Master’s University began to minister in Albania. Their labors led to the foundation of a local educational organization that was used of God to start a Bible church. As the church grew it became clear that its young leaders needed more in-depth theological training. In 2005, graduates of The Master’s Seminary launched Southeastern Europe Theological Seminary (SETS), The Master’s Academy International’s member school in Albania. As with all TMAI member schools, the goal of SETS was to train national leaders to lead the church and raise up the next generation of leaders. Astrit was the first Master of Divinity graduate of SETS in 2008. He puts the training he received into practice by serving as an elder in a local Albanian church. As he says it, “My greatest joy is when I’m able to preach before the people and to tell them the truth, which comes from the Bible.” Astrit also serves at SETS, which recently took a major step in its goal of creating an Albanian-led training center. 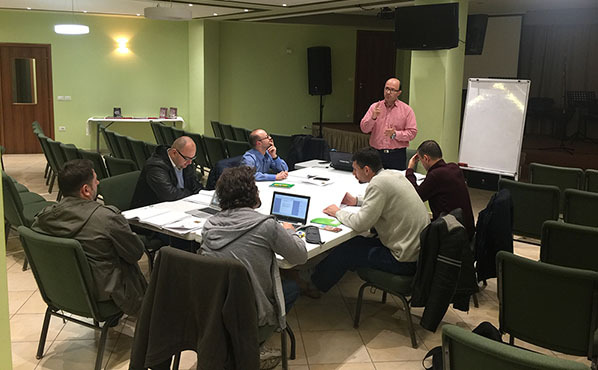 Astrit now serves as the academic dean for SETS and recently began teaching Biblical Hebrew—the first time that Albanians have been taught the biblical language by another Albanian! Thanks to a close partnership with European Bible Training Center (EBTC—TMAI’s training center in Germany), Astrit has also continued pursuing further education and is on the verge of completing a Masters of Theology (ThM). This degree will help Astrit and SETS to continue to work toward a training center for Albanian pastors led by Albanians. You can help by praying for Astrit, as he works to shepherd his family, serve as an elder in his church, teach the men of SETS, and complete his ThM thesis—which he hopes to finish this summer. You can also help by supporting the mission of TMAI and SETS. For $205, you can cover the cost of a student like Astrit in his continued studies, or the six men in his Hebrew class. To offer your support today, click here.